 Wexler Packaging Products lets no grass grow under our feet! From October 14th-17th we’ll be back (with 3 booths!) at McCormick Place in Chicago, IL for Pack Expo International and Healthcare Packaging Expo, a co-located event by PMMI. Get inspired alongside 50,000 attendees and learn from 2,500+ exhibitors at the packaging industry’s largest global event this year. Witness what a real win-win looks like at Booth #E-9017, our Ravenwood booth with the Nobac 500. This versatile machine is a linerless labeling system that applies several different formats of labels for a variety of products. Thanks to the Nobac 500, you can lower your carbon footprint and reduce packaging waste with one simple choice. Once you have ventured through the Lower Lakeside of McCormick Place, stroll on up to Booth #E-7335 in the Upper Lakeside Center to see almost 800 square feet of state-of-the-art ATS banding equipment. Here you’ll find a smorgasbord of solutions from space-savers like the stand-alone ATS MSX 420 and the US-2000 AD 260×180, all the way up to the automated US-2000 SIB-TTP-R and the US-2000 TRS-SW 550. You’ll even get to experience a few of our alternative options like the Flex Strap XL – a stretch film bundler, and the Pak-Tyer, which does just that – automatically ties your product so you don’t have to. After sampling all facets of the packaging world, don’t forget to cross over to the West Building where you’ll get a closer look into the pharmaceutical industry at the Healthcare Packaging Expo. At Booth #W-1042, see the US-2000 CL-TS-L, a corner line automated banding machine with turn station that can band up to 150 products a minute. It’s the perfect solution for packaging pharmaceutical boxes and creates easy opening for the end user. We’ll also be featuring the US-2000 AD 360×260 and the US-2000 AD 360×260 TTP. As always, the Wexler Team will be on standby waiting to answer any questions and share their knowledge on how our simple solutions can save time, money, and the environment. Want to expand your knowledge? Check out 100+ free seminars and presentations throughout each day with topics such as Debunking Myths of Interconnectivity, Addressing Challenges of E-Commerce Packaging, Sustainable Labels, and more. Click here and use our complimentary code 59M35 to get your free pass today. We hope to see you there!